SOMEWHERE, I cannot tell you exactly where, but certainly in vast Russia, there lived a peasant with his wife and they had twins — a son and daughter. One day the wife died and the husband mourned over her very sincerely for a long time. One year passed, and two years, and even longer. But there is no order in a house without a woman, and a day came when the man thought, "If I marry again possibly it would turn out all right." And so he did, and had children by his second wife. The stepmother was envious of the stepson and daughter and began to use them hardly. She scolded them without any reason, sent them away from home as often as she wished, and gave them scarcely enough to eat. Finally she wanted to get rid of them altogether. Do you know what it means to allow a wicked thought to enter one's heart? The wicked thought grows all the time like a poisonous plant and slowly kills the good thoughts. A wicked feeling was growing in the stepmother's heart, and she determined to send the children to the witch, thinking sure enough that they would never return. "Dear children," she said to the orphans, "go to my grandmother who lives in the forest in a hut on hen's feet. You will do everything she wants you to, and she will give you sweet things to eat and you will be happy." The orphans started out. But instead of going to the witch, the sister, a bright little girl, took her brother by the hand and ran to their own old, old grandmother and told her all about their going to the forest. 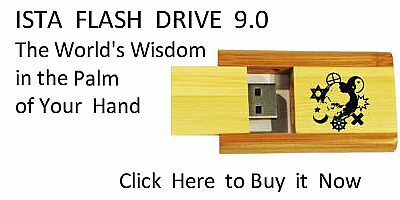 one; do not speak ill words to any one; do not despise helping the weakest, and always hope that for you, too, there will be the needed help." The good old grandmother gave the children some delicious fresh milk to drink and to each a big slice of ham. She also gave them some cookies—there are cookies everywhere—and when the children departed she stood looking after them a long, long time. "Izboushka, Izboushka! turn thy back to the forest and thy front to us!" The hut did as they commanded. The two orphans looked inside and saw the witch resting there, her head near the threshold, one foot in one corner, the other foot in another corner, and her knees quite close to the ridge pole. "Fou, Fou, Fou!" exclaimed the witch; "I feel the Russian spirit." "Ho, grandmother, our stepmother sent us to thee to serve thee." "All right; I am not opposed to keeping you, children. If you satisfy all my wishes I shall reward you; if not, I shall eat you up." "Sweet girl, do not cry. Give us cookies and we will help thee." The little girl willingly did so. "Now,"gratefully squeaked the mice, "go and find the black cat. He is very hungry; give him a slice of ham and he will help thee." "Kind-hearted little children, give us some crumbs and we will advise you." "Some clay and water, children dear!" Then away they flew through the air. "Dear Kitty-cat, black and pretty, tell us what to do in order to get away from thy mistress, the witch?" "Well," very seriously answered the cat, "I will give you a towel and a comb and then you must run away. When you hear the witch running after you, drop the towel behind your back and a large river will appear in place of the towel. If you hear her once more, throw down the comb and in place of the comb there will appear a dark wood. This wood will protect you from the wicked witch, my mistress." Baba Yaga came home just then. "Is it not wonderful?" she thought; "everything is exactly right." "Well," she said to the children, "today you were brave and smart; let us see to-morrow. Your work will be more difficult and I hope I shall eat you up." The poor orphans went to bed, not to a warm bed prepared by loving hands, but on the straw in a cold corner. Nearly scared to death from fear, they lay there, afraid to talk, afraid even to breathe. The next morning the witch ordered all the linen to be woven and a large supply of firewood to be brought from the forest. path almost scratched their eyes out, but the gentle girl fastened a pretty ribbon to it. So they went farther and farther and ran out of the dark forest into the wide, sunny fields. The cat sat down by the loom and tore the thread to pieces, doing it with delight. Baba Yaga returned. "Where are the children?" she shouted, and began to beat the cat. "Why hast thou let them go, thou treacherous cat? Why hast thou not scratched their faces?" The cat answered: "Well, it was because I have served thee so many years and thou hast never given me a bite, while the dear children gave me some good ham." The witch scolded the dogs, the gates, and the birch tree near the path. "Well," barked the dogs, "thou certainly art our mistress, but thou hast never done us a favor, and the orphans were kind to us." "We were always ready to obey thee, but thou didst neglect us, and the dear children smoothed us with oil." 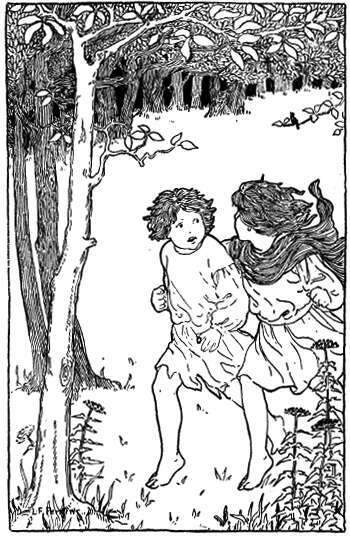 "The children ran away as fast as their feet could possibly carry them"
The birch tree lisped with its leaves, "Thou hast never put a simple thread over my branches and the little darlings adorned them with a pretty ribbon." Baba Yaga understood that there was no help and started to follow the children herself. In her great hurry she forgot to look for the towel and the comb, but jumped astride a broom and was off. The children heard her coming and threw the towel behind them. At once a river, wide and blue, appeared and watered the field. Baba Yaga hopped along the shore until she finally found a shallow place and crossed it. Again the children heard her hurry after them and so they threw down the comb. This time a forest appeared, a dark and dusky forest in which the roots were interwoven, the branches matted together, and the tree-tops touching each other. The witch tried very hard to pass through, but in vain, and so, very, very angry, she returned home. "Ah, father dear, why dost thou love us less than our brothers and sisters?" The father was touched and became angry. He sent the wicked stepmother away and lived a new life with his good children. From that time he watched over their happiness and never neglected them any more. How do I know this story is true? Why, one was there who told me about it.